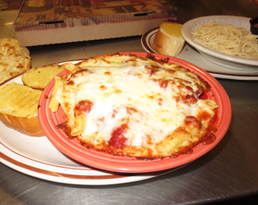 All entrees are served with two pieces of grilled garlic bread and your choice of soup or a house side salad. *Half orders do not include soup or salad. Tube shaped pasta filled with our creamy ricotta cheese blend, baked with our homemade spaghetti sauce and mozzarella cheese. Full order of thin spaghetti noodles topped with loads of our hearty spaghetti sauce. Half order of thin spaghetti topped with our fantastic sauce, served with one piece of garlic bread. Full order. A mountain of layers of our rich, hearty spaghetti sauce, ricotta cheese blend, sliced meatballs, tender lasagna noodles and secret spices. We promise that you’ll crave it! Half order of lasagna: served with one piece of garlic bread. Half servings of spaghetti & a meatball and our fabulous lasagna. The best of both worlds! A fantastic blend of creamy white sauce loaded with an assortment of cheeses, ham, bacon, mushrooms and tomatoes, with penne noodles delicately tossed in. Wow, this is amazing! Homemade Alfredo sauce, diced tomatoes, fresh mushrooms, bacon, and artichoke hearts, tossed in seasoned grilled chicken and spaghetti noodles. Fettuccini noodles and mushrooms delicately tossed in our creamy Alfredo sauce. Tender, cheese filled tortellini served with either our homemade spaghetti or Alfredo sauces. Penne noodles topped with spaghetti sauce, layered with sliced meatballs, baked with mozzarella cheese. Penne noodles topped with our signature white sauce, layered with chicken and mushrooms, baked with mozzarella cheese.